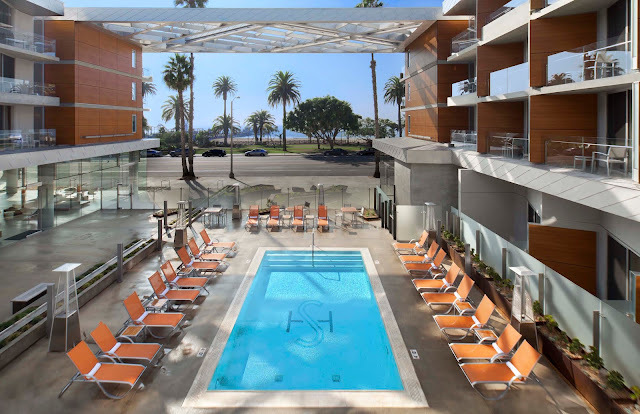 It doesn’t take a luxurious property (or budget) to build in sustainability, but the Shore Hotel Santa Monica is a strong example of how luxury and green building can work hand in hand in the hospitality industry. I’ve profiled elements of the Shore Hotel, Santa Monica’s newest boutique hotel to combine LEED with luxury. Some background: Last month, the Shore Hotel joined an elite group of sustainability leaders within the hospitality industry when it received LEED Gold certification for its design and construction, decreasing the hotel’s environmental footprint by reducing waste and promoting energy and water efficiency. Let’s take a look at some of the features that make this project a verifiably green hotel. First, hotels are unique because of the high volume of individual guest rooms, each of which requires its own supply of energy and water (known as compartmentalization) even when the room is empty. To combat wastefulness, the project team installed individual guest room controls which setback the HVAC (heating ventilation and air conditioning) system and turn off the lights when rooms are unoccupied. Smart way to reduce energy, right? Furthermore, ultra low flow plumbing fixtures in all common areas and guest rooms reduce potable water use on-site. Another cool feature of the hotel is its U-shaped design, facing out toward the beach. Not only does this intelligent use of passive-solar design maximize ocean views and breezes for hotel guests, but it also increases the amount of natural daylight entering common areas and guest rooms. This reduces the need for artificial lighting and creates a healthier indoor environment for guests. 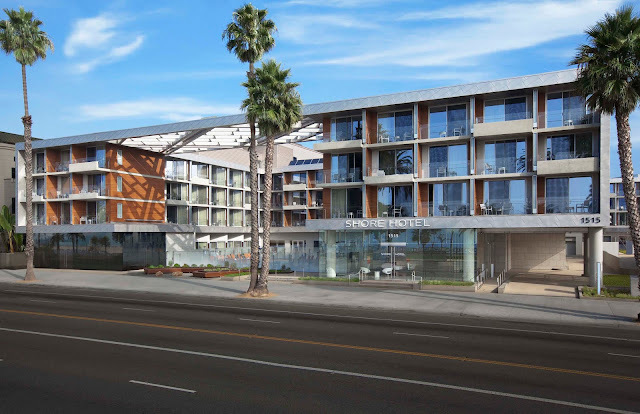 Finally, one of the most innovative aspects of the project is that it is the first newly constructed hotel to voluntarily participate in the Southern California Edison Auto Demand Response program (fun fact: SCE is the first utility sponsor to join USGBC’s Demand Response Partnership Program). This means that when the power grid becomes stressed with too much demand, the Shore Hotel’s Energy Management System (EMS) will automatically implement measures to reduce its energy use in order to ease the strain on the grid. To understand Demand Response, think of what airlines do when a flight is overbooked; They will ask volunteers to give up their seats in return for a free ticket at a later time. In the case of Demand Response, the utility company is the airline and the Shore Hotel is the passenger, who instead is rewarded with tax incentives and rebates on energy purchased in the future. All in all, a look at the Shore Hotel’s sustainability efforts reveals multiple takeaways for prospective green hotels. Learn more about the Shore Hotel Santa Monica’s LEED certification and green features on the hotel’s website. Do you know of a LEED hotel worthy of a case study, or would you like to submit your project for consideration? Catch up with me on Twitter at @Kal_Wellman. This is a really good scan for me, Must admit that you are one among the most effective bloggers I ever saw.Thanks for posting this informative article. Did you know you can get these AUTOMATICALLY & ABSOLUTELY FOR FREE by getting an account on Add Me Fast?